Roxie Watson has been near and dear to my heart for quite some time. The four-piece amiably dips into bluegrass, country, rock-a-billy, and folk with equal measure, and on their fourth release Try A Little Kindness, they throw in a generous helping of humor. While the band divvies up vocal and songwriting duties, Lenny Lasater's cigarette-infused alto takes the fore on this outing, giving the album a pleasant down-home folksiness. My bread being made from spelt! 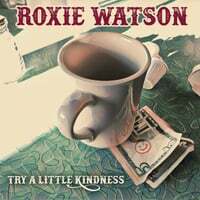 The band members have played together in various configurations for decades, and Roxie Watson has never sounded tighter. Try A Little Kindness showcases inventive storytelling that reminds us that real Americans have common sense, dignity, and compassion for others. Thanks for reading! You can support the blog and podcast by subscribing to our Patreon or dropping a one-time tip in our Ko-fi cup! Stop by tomorrow for the full podcast!